If I'm perfectly honest, I've never been a massive fan of colouring books. Why limit a child's creativity by giving them something to colour when they could have the freedom to draw something of their own? I think having two boys who were never particularly into colouring and could never sit still for long made me think that kids just didn't want to sit still for hours on end to colour a picture. But when Miss T came along, we noticed from a very early age that she loved to grab hold of a pen and do 'writing' and 'drawing' - Most children start their mark making on a large scale but Miss T liked to make tiny little marks and circles that from a distance actually did resemble writing. Whereas at this age (she's now 4) the boys had shown very little interest in colouring, Miss T really does enjoy colouring books and colouring sheets. But I knew she was too young to fully appreciate the detail needed in the Where's Wally? colouring book. D has always been creative, with his flair for cooking, his talent with music and his love of art. He's now 10 so I felt this would be a great activity for him. BUT instead of giving him the Where's Wally Colouring book to review as I normally would for book reviews, I actually introduced it as MY book. I've been learning about the Incredible Years research in recent months and one of the foundation stones is built on spending time playing with your child. So I knew immediately this colouring book could become a focus for our 'play' - for some quality one to one time spent with D.
This colouring book is so detailed and has so much to do that it reminds me of those colouring books aimed at grown-ups. I actually think it would make a fab grown-up's colouring book as it's so engaging and therapeutic just to spend sometime thinking of nothing else but colouring in. With no wrong or right, just totally absorbed in one activity. This book has LOADS of detailed mainly double paged spreads to colour in. There are various themes to the pages, like a dinosaur themed picture, a seaside theme, a bandstand theme and so on. Some of the pages already have a small splash of colour, whilst others are completely black and white. A few of the pages are slightly less detailed making them potentially easier to colour in. We even dared let young Miss T loose on one of the pages - that's the great thing about this book - it really can be enjoyed by all the family and provides literally hours and hours of fun. I love this You Tube video from Walker books which shows really well just how all the family can get involved. And for some of the pages, you really will need all the teamwork help that you can get because of the level of detail! Do you know what - we had so much fun with the colouring part that we almost forgot to actually look for Wally!!! Of course he is there, hiding in every picture but it is even more tricky to find him in black and white. And as if this wasn't packed with enough fun to last for hours, there are even checklists at the back of the book to find specific things in each picture. As I had decided to keep the colouring book as my own, I've decided to give J and D one of the Where's Wally activity books each. There's the Where's Wally? Across Lands Activity Book which I think D will enjoy as it covers some topics and themes that he's been learning about at school and the Where's Wally? In Outer Space Activity Book which will be a great one for J. Again he did a space topic at school a while ago and really got into it so I know he'd enjoy this. We've got some long journeys coming up in the summer holidays so I've hidden these from them until then. They'll also be great for rainy day fun if we end up stuck indoors due to the great british weather this summer. Of course I had a sneak peak myself first...each of the activity book has a page of stickers at the back and the books are packed with puzzles, mazes, and matching games. Disclosure: We were sent these books for the purpose of review. All opinions are our own. My eldest son, J turned 12 last week. How that happened I don't know as I remember his baby days so clearly. He hardly slept as a baby, he was a climber and a runner so had me on my toes the whole time. 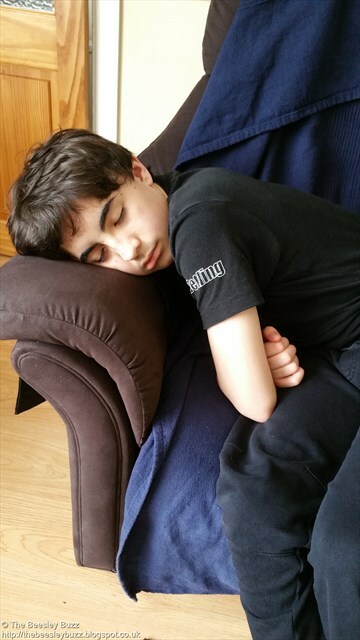 He'd asked to go to Laser Tag so we booked his party at Quex Park Laser Combat which is an outdoor laser tag venue which also does paintballing. We were really impressed with how well organised it was. Once they'd set off to start playing, me and Miss T headed to Jungle Jims, a soft play venue also at Quex Park where we had lunch and a play in both the indoor and outdoor play areas. They all seemed to really enjoy the laser tag and J was so exhausted he had his first nap since those baby years when it was a struggle to get him to sleep! D and Miss T had chosen him a Chewbacca play figure for Disney Infinity for his birthday that he was thrilled with. What a rollercoaster ride the past 12 years have been but we are so proud of you J. We always saw your potential even when others didn't and you've gone on to show your incredible academic abilities getting top scores across the board in your secondary school. Where others, without any diagnosed difficulties, have struggled to make the transition to secondary school, you have taken it in your stride and really excelled and thrived. We know life isn't always easy for you but we know you will continue to do your best in everything you do. Kirby Planet Robobot is the latest fantastic new game from Nintendo for the Nintendo 3DS, featuring the lovable Kirby. As with other games in the Kirby franchise, this will be loved by Kirby fans and Platform fans new to this character. When Kirby's world (Planet Popstar) gets taken over by robots, Kirby has to save it. All the enemies are robot versions of themselves and Kirby uses cool robot outfits to defeat the bosses. The final bosses are Mecha Knight+, President Haltmann and Star Dream. When you defeat Star Dream you use a robot spaceship. Team Kirby Clash is a different mode where you battle bad guys with computer players. There are four different characters you can play as and they each have different stats. My favourite is the Sword Hero because his attacks are really powerful. There is another mode called Kirby 3D Rumble where you run around on a 3D area eating the bad guys to get points. In Kirby Planet Robobot, Kirby's creative copy ability is great. He can scan enemies, then use their skills against them. Stuck somewhere? Use the Wrench to move scenery. Need a new attack mode? Engage the Jet Mode and fly across in shoot-em-up style to defeat the enemy. 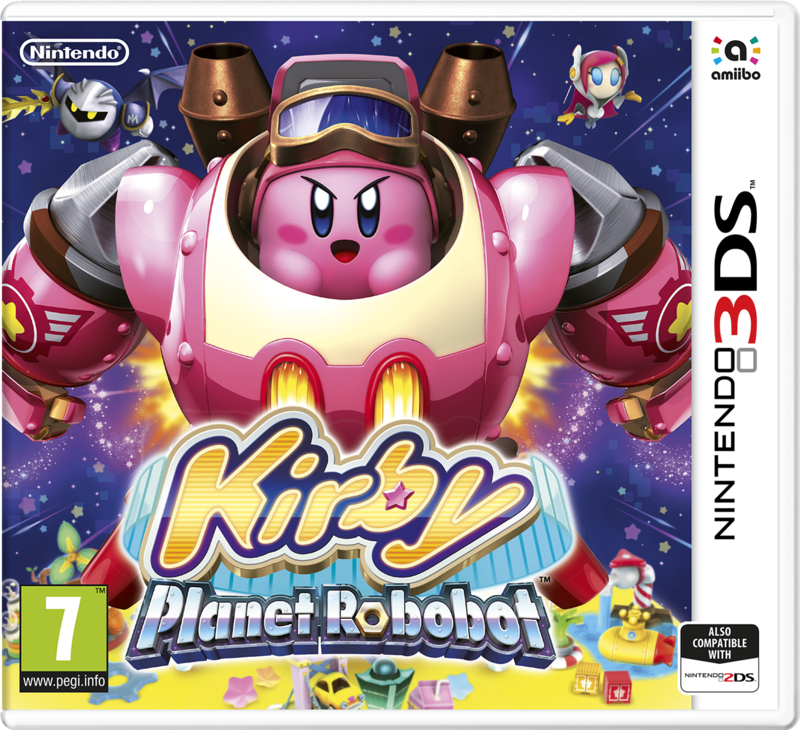 Kirby Planet Robobot can be played together by up to four players via Local or Download play for a new type of adventure where you work collaboratively to support each other and defeat the enemies. And to add to the fun, try scanning your favourite amiibos to see what power it gives Kirby - the Mario amiibo gives Kirby the Fire Ability, for example. We are big fans of Kirby already, and love this new adventure which is sure to join Kirby Triple Deluxe and Kirby and the Rainbox Paintbrush as one of our favourites! I really like this game because when you are a robot you can smash lots of things. I give this game 1000/10! As Nintendo Family Bloggers we were sent a demo version of Kirby Planet Robobot for the purposes of review. All opinions are our own. We all know that water is essential. Everyone needs water. Yet Robinson's have found 42% of children say water tastes boring! We want to prove that water can be fun fun fun. SO. MUCH. FUN. We had a great time putting together this video but we've actually got a few more ideas for making water that bit more special with a little help from Robinson's Squash'd. We used Robinson's Squash'd to make some cool flavoured ice lollies. Simply squeeze a tiny bit into lolly moulds, add water and freeze. A fantastic way to stay hydrated this summer. To give your drinks a pretty and flavourful twist, you can also make some awesome ice cubes using herbs, edible flowers or pieces of fruit. It's a great opportunity to chat to the kids about the importance of only picking edible plants from the garden. Herbs like mint, coriander and basil can be used. Edible flowers like chive flowers, forget-me-nots, and rose petals also work well. Miss T's favourite summertime activity is lying on a picnic blanket and watching the clouds in the sky. A great opportunity for learning about how clouds are formed and to use imagination to see what shapes you can see in the clouds. We've spotted imaginary dragons and castles and lions. We found Robinsons Squash'd to be the perfect picnic companion as it is such a neat little container that fits so easily in a pocket or picnic basket to stay hydrated all day! It's so easy for little hands to use too so the kids can help themselves to drinks without me having to supervise so closely. After all that cloud watching you can follow up with a fun experiment that shows the water cycle in action. My kids love to hear the amazing fact that pretty much all the water on planet earth is the very same water that's been around since dinosaur times. That's a cool fact! It just goes through the water cycle again and again. 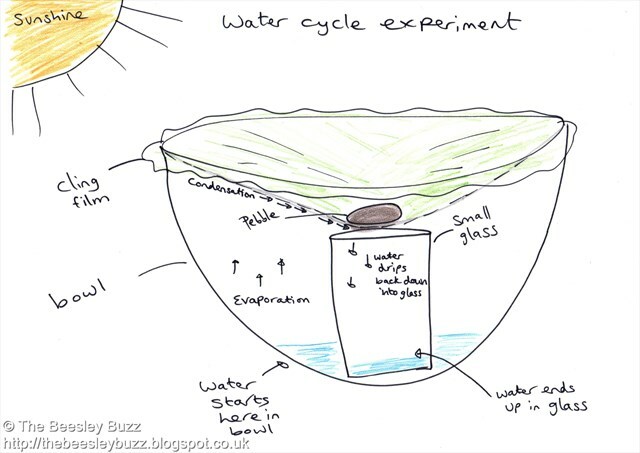 Using a bowl, a smaller glass to fit in the bowl, some cling film and a pebble you can make your own water cycle experiment to show how evaporation and condensation works. You start with the water in the outside bowl and the idea is that it evaporates, hits the cling film, condenses and then runs down into the glass and you end up with water in the glass which started out empty. Pond dipping is another water based activity with huge learning potential. Look out for free organised pond dipping sessions run by local wildlife and conservation trusts near you or print off some insect identifying sheets and head off yourselves to see what you can find. Silhouettes and Snow - Water play in many ways! Now I'm going to share with you some of my absolute favourite forms of water play. Of course there's the obvious paddling pools and water guns but my real favourites are a little more unusual and will totally blow the kids minds. On a hot sunny day, set your hose to the fine mist setting. Then get the kids to lay on the patio. They can make different shapes with their bodies. Then spray a fine mist of water over them. This will cool them off and when they stand up they will see a cool silhouette shape that is left on the floor! It soon dries out on a hot day and you can repeat over and over. Yes I said snow. In summer. Yep. Snow. Whenever we are lucky enough to get a snowy winter, I save a couple of small tubs of it in the freezer and then get it out on the hottest day of the year. It doesn't last long but the short while that the kids can play with it before it melts is a fab sensory experience of the two extremes of hot weather and freezing cold snow. And seeing it out of context makes it all the more special. 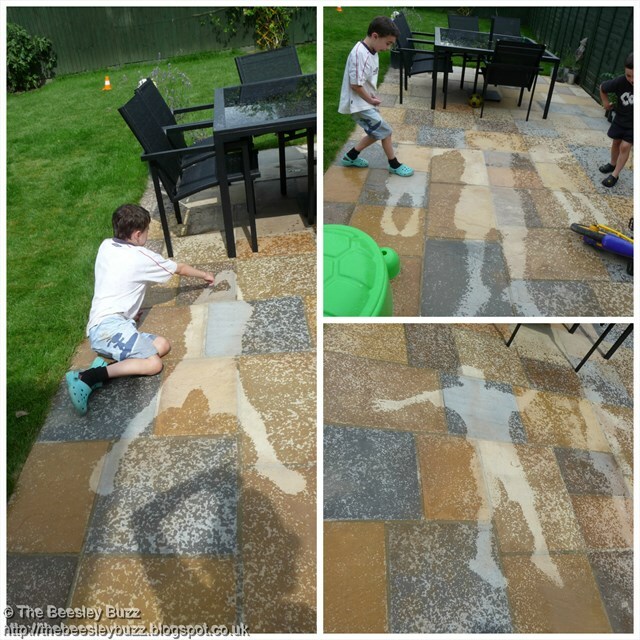 A simple activity that's far less messy than getting the paints out is to get some chunky paintbrushes and buckets of water and 'paint' anywhere the kids wish to in the garden...the patio, the walls of the house, the fences. 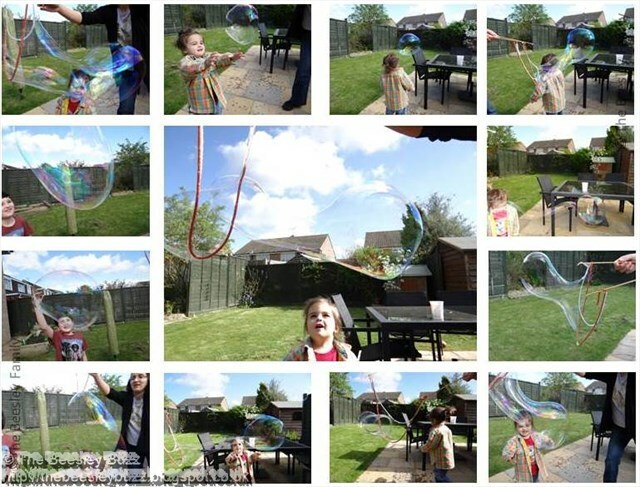 Since I discovered that I could make my own giant bubbles, I have loved getting out in the garden and seeing just how big the bubbles will get. The secret ingredient is glycerin. So as well as using water and washing up liquid to make your bubble mixture, add in some glycerin to stop those bubbles bursting before they've grown really big. A home made bubble wand can be made using strings and sticks too! I hope you can see why we think water is fun to play with and fun to drink too with a little help from Robinsons. 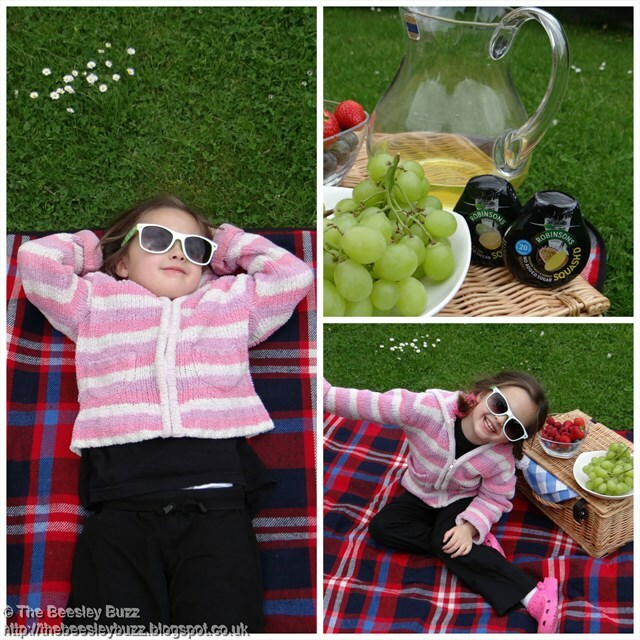 This post is an entry for BritMums #EnjoyMoreWater Challenge, sponsored by Robinsons You can find out more about the challenge here. We were lucky enough to be sent some Robinsons Squash'd to try. All opinions are our own. We launched a flash giveaway just before the weekend to show our support for Nim's Fruit Crisps which we love so much. They'd made it to the shortlist for the Muddy Stiletto's award for Best Local Producer (Food and Drink category) in Kent. So without further ado, we also drew and verified the rafflecopter winner of our giveaway and we are delighted to announce that Janet Bagnall won the box of fruit crisps. We've contacted Janet and her Nim's crisps should be on their way soon. 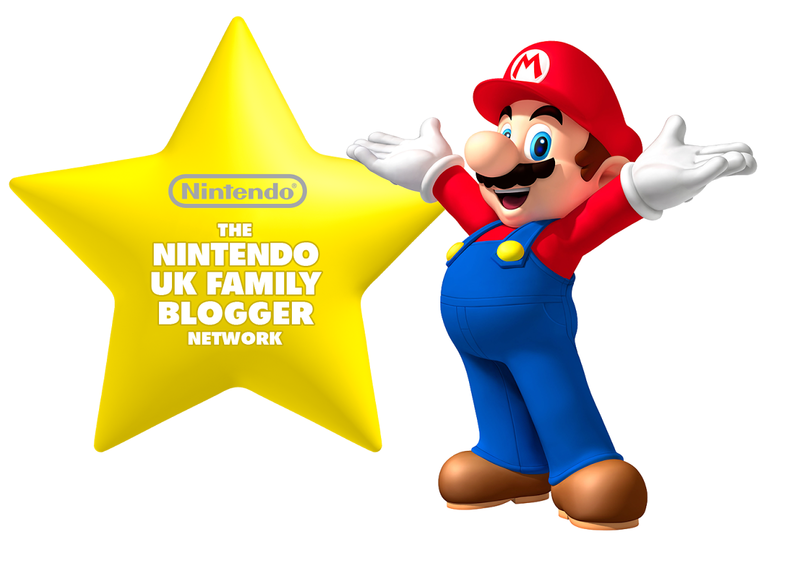 Thanks so much to all who voted and all who entered. It was the first 'flash' giveaway we have run and it was a huge success so a very heartfelt thank you to everyone. Do you ever have something on your to-do list that is on there for so long that it actually becomes embarrassing to get round to doing it. Like those birthday thank you's you never got around to sending and it's been over 6 months since your birthday. That kind of thing. 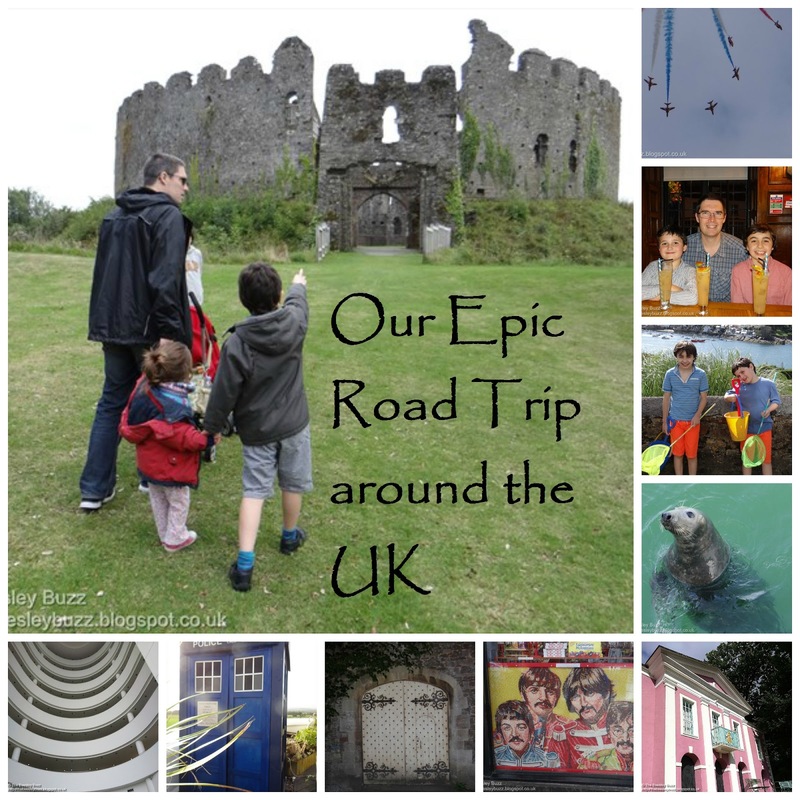 Well one of mine was to write a compilation post of our road trip around the UK that we did a couple of years back. Yep you read that right, 'years' and I still haven't got around to it. But seeing a post about a road trip on one of my favourite travel blogs 'Hand Luggage Only' finally gave me the push I needed to do it. So these are links to all our 'diary style' posts we wrote after our summer road trip, all in one place so I can find them again when I wish to. As they were written 'on-the-go' rather than in any organised form afterwards, there is not one post per day but rather a bit of a mish-mash as we went along. The one where we drove across three counties in one day and arrived in Wales! The one with our surreal hot tub experience (on the roof of a lighthouse next to a lifesize TARDIS!!!) and arriving in Portmeirion. Thinking back to it, it was tough travelling on the road for so many hours with 3 kids, but the memories we made were SO worth it. There are definitely places I would love to visit again and there are other places truly worthy of a visit which we didn't get around to visiting on this road trip. For example, we love Bath and Brighton but we are familiar with both of those places having lived there so they didn't get included in this road trip. I've always wanted to visit Scotland but that was just too far to include. I've seen photos of Fingal's caves and REALLY want to go there. London is always great to visit but we live pretty close to London so will have plenty of other opportunity's to go there. Some of our top things to do in London are detailed in this blog post. London RIB voyages is a must as seeing London by speedboat is just awesome and we've since visited Madame Tussauds and was really impressed by how good it is these days. There are so many beautiful and amazing places right on our doorstep in the UK and we'd definitely love to have another road trip like this again! From first smiles to first steps, there's no doubt about it, those 'firsts' are precious moments. I always think of those early days with a newborn baby as a magical time. You press the pause button on the world around you and nothing else matters whilst your new baby takes priority in those early days. Having this blog has meant that we've captured far more of Miss T's milestones than we did when the boys were younger - I'll always love my blog for that reason. Of course we have photos of the boys too from their early days but things have just not been so meticulously recorded. When we saw this challenge with WaterWipes, it presented the perfect opportunity to document all of Miss T's precious first moments and although it's been a mammoth task sorting through literally thousands of photos and video clips, it's been worth it to put together this video of all her special 'firsts'. As the journey through parenthood continues, I know there will be many more 'firsts' as these special milestones change along the way. Precious moments we will treasure forever in our hearts regardless of whether we manage to capture them on camera or not. These memories are unique to our children. Sure you will find facebook filled with 'firsts' as parents boast about their little ones' achievements. 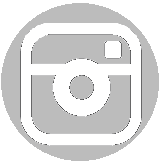 Used in the right way, social media can be great for sharing, caring, and supporting each other. Celebrating each others milestones without comparing is the way to go. This truth became so apparent when we saw the struggles that our eldest son, J faced with his first experience of school. It made us value all the more his unique traits and qualities and we were determined not to let the 'label' of Aspergers negatively affect his life. He was unique and different but as the phrase goes that Temple Grandin made famous, he was 'different not less'. His 'firsts' may well have been done differently and at a different pace to others but to us they were just as special, unique and precious. One of the milestones that is most overlooked is the 'mummy milestone'. Becoming a parent is a huge milestone in a persons life and it brings with it a massive learning curve along with huge responsibility. I remember 'baby's first bath' being just as big a milestone for us as mum and dad as it was for our baby! 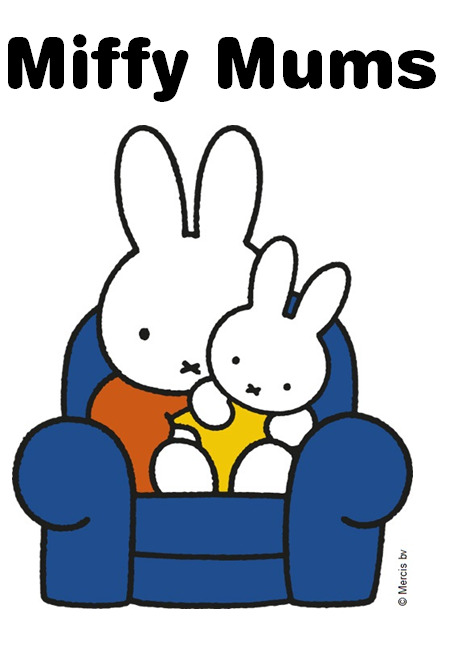 I remember feeling nervous with those first few nappy changes as I learned to get to grips with it. If you'd told me then that one day the speed and efficiency that I'd be changing nappies at would rival the efficiency of a formula one pit stop, I'd never have believed you but as time went on it got easier and easier and I became confident at changing nappies any time, any place! My own personal biggest 'mummy milestone' was going out WITHOUT my baby for the first time. After the initial shock of having to adjust to having a newborn baby so dependent on you for those first few weeks, when the time came for my first outing without baby, it was a massive occasion. I remember my friend telling me that the first time she went out without her baby, she wanted to hang a sign around her neck saying 'I'm a mummy'. I found that so touching as it showed what a huge milestone becoming a parent is and it is often under-acknowledged and under-recognised in society. So whatever stage you are at in your parenting journey, whether it's that first nappy change or your son or daughter's first day at university, those precious milestones will keep happening. So try to enjoy those firsts. Enjoy, embrace, encourage. Don't compare - Your family is unique, your baby's milestones will be too and remember to celebrate those MUMMY milestones along the way too! This is my entry into the Tots100/WaterWipes Baby Milestones challenge. Find out more about the challenge here and find out more about WaterWipes here.